Continuing my Streak for Mia to raise awareness about pediatric stroke and funds for Children’s Hemiplegia and Stroke Association. I’m deviating here from some of my recent posts about the labor of parenting two to celebrate the joys this Memorial Day weekend. We’re on Cape Cod. It’s probably more work to travel than to stay home with little ones but it’s definitely worth it and getting easier as they get a bit older. 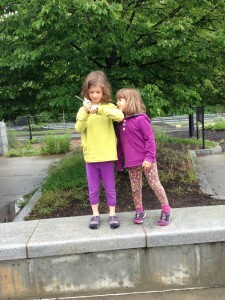 This morning, it was very rainy at home and we had some errands to do before hitting the road. We made it to Welfleet by 2 pm, checked into our hotel, and got settled a bit before our big afternoon adventure. We brought our bikes – Zoe’s 20″ bike, my old bike with a trail-a-bike behind for Mia. The northern end of Cape Cod Rail Trail is only about five minutes drive from where we are staying so we parked there and got the bikes off the rack and connected the trail-a-bike to my bike. At home, they stay connected in our shed for quick trips to the playground which we’ve been doing on nice evenings this spring. But, this was our first longer ride as a biking trio. The last time I biked with them on the Cape was two years ago and they were both in a bike trailer so it was a lot of work for me. 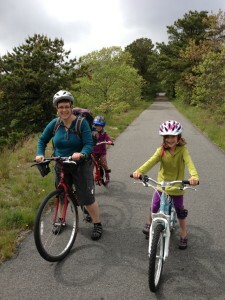 We probably rode five miles total, a stretch along the rail trail, then we turned on the road toward Marconi Beach. 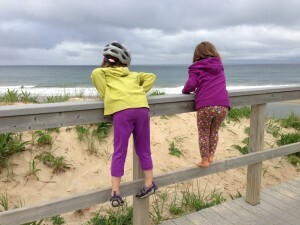 Sadly, the beach access was washed out by winter storms so we looked wistfully at the Atlantic Ocean. 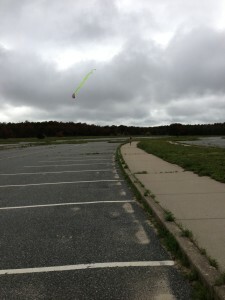 We had picked up a new kite this morning and the plan for this afternoon was actually Zoe’s idea. She said she wanted to bike to the beach and fly the kite. 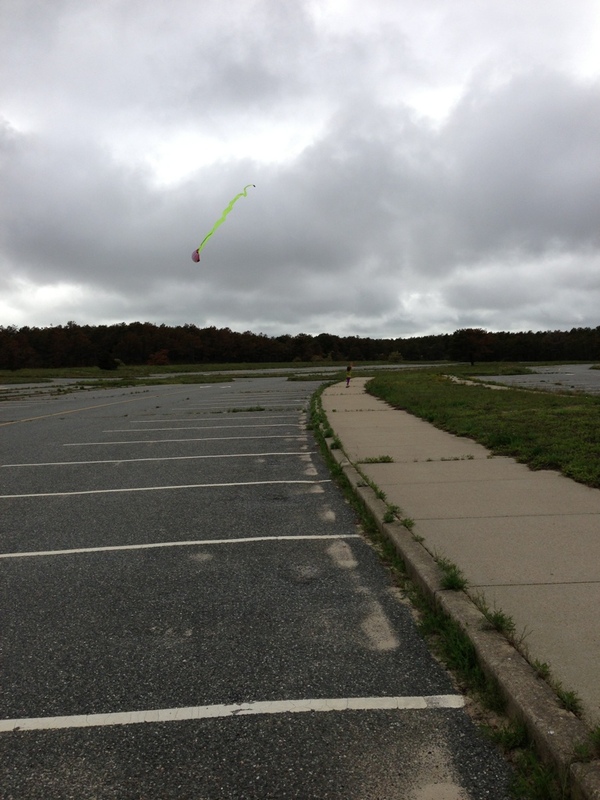 We couldn’t fly it on the beach but the parking lot was empty so we had fun with the kite anyway. 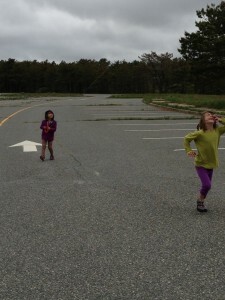 On the ride back to the car, it was windy and misty so we stopped to put on rain pants and jackets. We drove back to town. 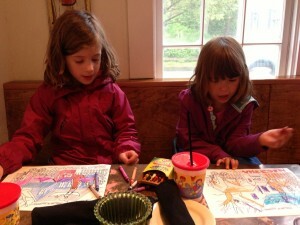 The girls and I had a nice dinner and everyone will sleep well after the biking adventure. 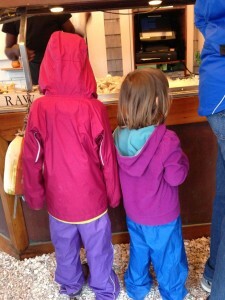 We are meeting up with another family tomorrow, a friend and her two girls (6 and 2 years old). We’ll try the bay side tomorrow and Monday as we think there will be sure beach access for kite flying and shell seeking and knowing my kids some splashing too even if it’s still 60 degrees. This entry was posted in Pediatric Stroke Awareness Month 2013, Uncategorized and tagged bicycling, Cape Cod, Kite, Mara, Mia, stroke, travel, Zoe on May 25, 2013 by mara.